This weekend offers plenty of swashbuckling action at Dartmouth College. 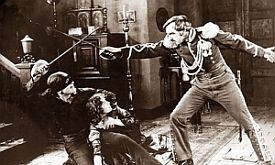 The Hopkins Center is presenting the 1920 silent film, “The Mark Of Zorro,” with live accompaniment from the Paragon Ragtime Orchestra. Playing on original instruments, the Paragon Orchestra adds punch and pizzazz to this feature length classic. The Paragon Ragtime Orchestra is dedicated to re-creating the syncopated sounds of early musical theater, silent cinema and vintage dance. The Orchestra was founded by conductor Rick Benjamin, who joins us now by phone. The Orchestra will be performing the original score to The Mark of Zorro, Saturday evening at the Hopkins Center at Dartmouth College.